Reaseheath is a land based College who have experienced extensive curriculum growth in Animal related courses. Hulme Upright were appointed in 2006 following a successful OJEU bid to redevelop their extensive land based estate. The College staff and students were suffering from dilapidated teaching and welfare accommodation and the animals were hidden behind closed doors – these were challenges that needed to be addressed as part of a comprehensive redevelopment of the department. 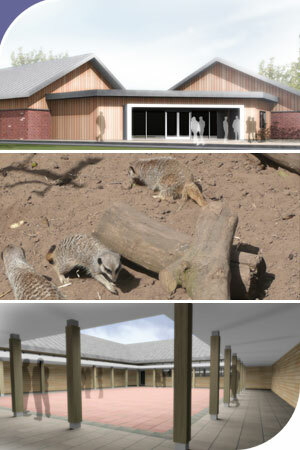 The proposed building sits within a conservation area and is designed to accommodate birds, mammals and reptiles together with students and staff in a range of open and flexible teaching spaces and offices. The spaces are arranged around an enclosed open courtyard, designed to enable the animals to be visible, yet contained and enable the students and staff to carry out practical teaching and learning.